Middle-class incomes shot up in 2015. America’s long, slow, and frustrating economic recovery hit an important milestone last year, as middle-class incomes rose for the first time since the Great Recession. 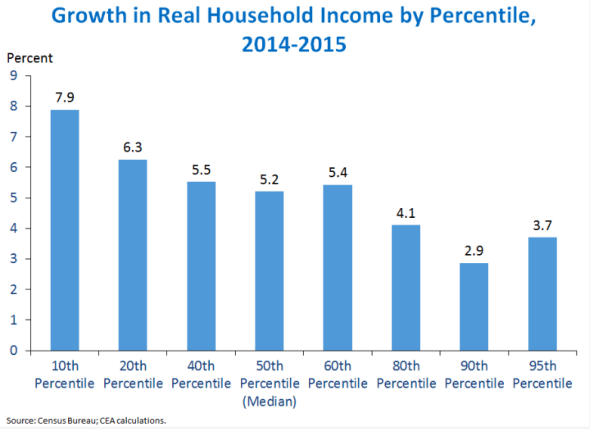 According to the latest annual analysis from the Census Bureau, real median household incomes jumped by a surprisingly strong 5.2 percent in 2015, which as the White House Council of Economic Advisers notes, is the fastest rate on record. The latest yearly increase occurred in 2007, before the housing bust and financial crisis put us all through an economic thresher. To put it another way, 2015 may go down as the inflection point when the recovery started to meaningfully filter down to typical American families. Economists and journalists have been wondering for years when middle-income households would finally see a reasonable raise as incomes lingered in their post-crisis ditch. But last year, they were up across almost all age groups (there was no significant change for 15- to 25-year-olds), races, and income bands. As this graph from the White House shows, the gains were in fact strongest toward the bottom. Because the census changed its survey methods in 2013, it’s a bit hard to compare the latest figures with past years. But at $56,500, the median household income was only 1.6 percent lower in 2015 than in 2007 (the revised approach is designed to pick up more of a family’s income). We haven’t climbed all the way out of the hole created by the recession, and stats like our depressed workforce participation rates show we still have a ways to go. 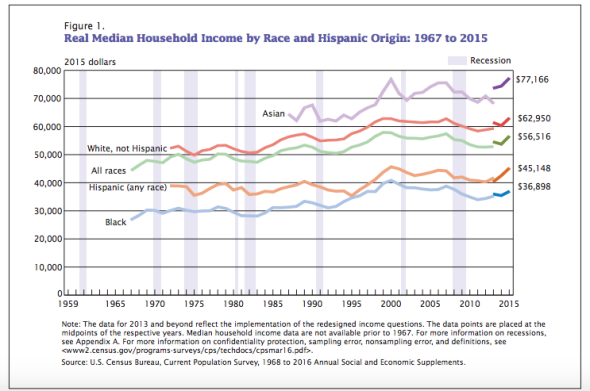 But judging by what households are actually earning, we’ve also clearly been headed in the right direction. 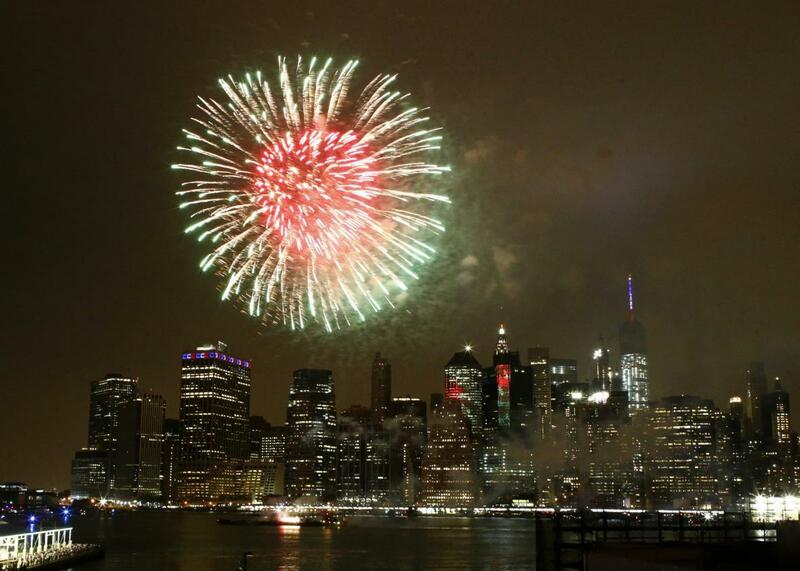 The Census Bureau reported other good news on Tuesday, as well. 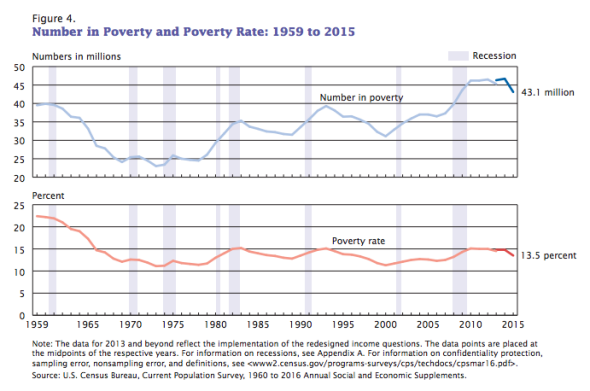 The poverty rate saw its largest decline since the recession, dropping 1.2 percentage points to 13.5 percent. Overall, there were 3.5 million fewer Americans living below the poverty threshold than in 2014. And, as other sources have suggested, the uninsured rate continued to fall. 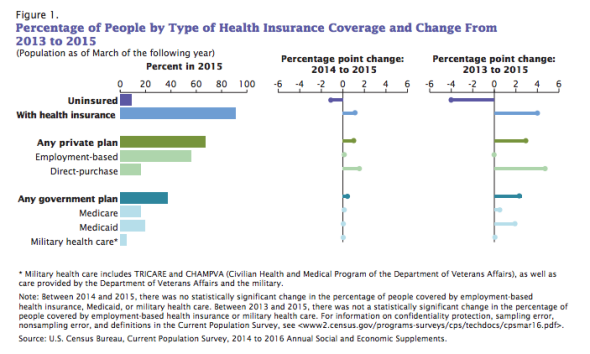 The percentage of Americans without health insurance for the entire year dropped by 1.3 percentage points, to 9.1 percent Since 2013, the uninsured rate is down 4.3 percentage points. Americans at all levels of the income ladder saw their financial lives improve last year. It’s been a long time since we’ve been able to say that. And given that wages have, if anything, been rising a smidge faster in 2016 while inflation has stayed low, I wouldn’t be surprised to see similar improvements in next year’s report. Which, of course, makes this election year seem all the more insane—just as this ship is starting to right itself, a whole bunch of voters are thinking of handing the captain’s wheel to Donald Trump.